Someday I'll Sleep Autism Blogs: Sadie's Saints Peg Doll Introduction and Giveaway! 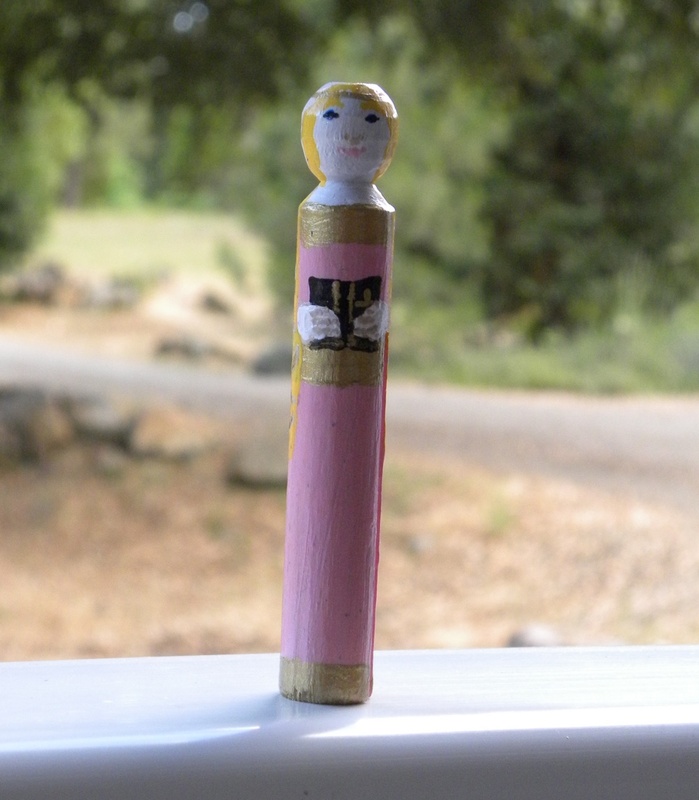 Sadie's Saints Peg Doll Introduction and Giveaway! 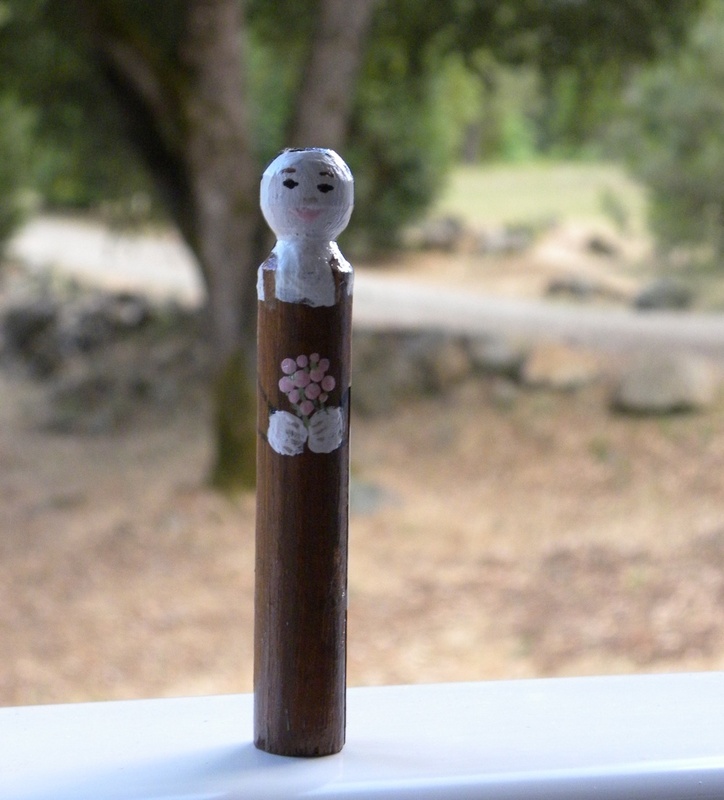 I didn't expect the little peg dolls that I made the girls as party favors for Sadie's birthday party to be such a smash hit. They've quickly become Mae Bae's all time favorite toy. She carries two of them around with her constantly. She tosses them in the air and listens as they smash down upon the ground with a smile. She hides them in any place large enough to fit them (there's a small tray below one of Nani's tables and I've learned that the dolls like to hang out there), especially if said hiding place is right at Mae Bae's eye level. Sadie, on the other hand, doesn't bring her dolls out nearly as often, because she's seen how her sister plays with her own dolls, and is pretty sure she doesn't want her own dolls receiving that sort of treatment. She's now hidden her own dolls by the bed, and plays with Mae Bae's pink dolls when Mae is awake, while watching her sister's crazy antics. Sadie's dolls tend to make an appearance when Mae isn't around (which, lets face it, is only at nap time). When I began thinking of making peg dolls I scanned around the internet to see what was out there and I found some extraordinarily beautiful peg dolls in various stores. 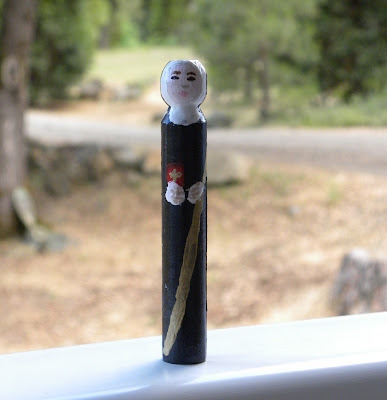 Yet I had a hard time picturing paying around $20-$30 for a peg doll, regardless of how beautiful it was, because I wasn't quite sure I could hand both paying $30 for a wooden peg and watching Mae Bae hurl it with all of her strength at the stove to see what sort of sound it would make. So I decided to come up with something that was simpler than what was already out there, but that still represented some of our favorite saints (I have a huge list of saints I'm planning on making in the coming months and I'm definitely open to suggestions). After hemming and hawing for quite a while over price I finally settled on $8 for the more detailed dolls and $6 for the simple Mae style dolls (those aren't yet posted and won't be saint dolls). I'm planning on eventually putting up listings for larger quantities, like 2 dolls for $14 (2 for $10 of the simple ones!) or 5 for $30. I'm also hoping to get up some of the doll storage rolls up (like the ones I made the girls for the party) once I have a few more dolls on the shop. And now for an event that is long overdue! A giveaway! I love the peg dolls! If I were to win, I'd have a hard time choosing a saint. St. Scholastica is a favorite of mine, and St. Teresa of Avila is my confirmation saint. St. Rita watches out for me, too! I would choose the Blessed Virgin Mary, but I love them all! I love the peg dolls. I don't have a use for them yet but I'm sure with friends kids having birthdays I can find a nice home for at least one of them. 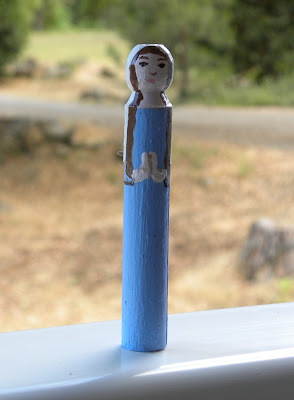 The St. Therese peg doll is adorable! I would probably ask for St. Therese.......or maybe St. Gerard!! Very sweet, I wish I had a little girl that would play with them. At 13, my dd would think I had gone insane if I gave her a doll! LOL!!! Love the Blessed Virgin Mary! I love your dolls and would love a chance to win! I would have to choose Our Lady :). Oh, they're adorable. :) I, personally, would totally go for St. Francis of Assisi. They are all so cute. I would choose the Blessed Virgin Mary, but I would be happy with any one of them. Hi Cam, I learned of your giveaway from Michelle of Liturgical Time and came over to enter. My choice would be The Blessed Virgin Mary. I think what you're doing is fantastic because it's building a connection into the child's world from our faith.